This weekend marked the beginning of Daylight Savings Time (DST) in the US and clocks were moved ahead one hour. We remember this by the phrase, “fall back spring ahead”. DST runs from March until November each year. Large countries, like the US, may have as many as three time zones. China, on the other hand, uses a single time zone for their entire country (UTC+8). North and South Korea use a single time zone called Korea Standard Time (KST). Neither country utilizes Daylight Savings Time although South Korea had considered using it several years ago and eventually abandoned the idea. Korea is UTC + 9 hours. Here are some interesting thoughts on why some people believe DST is useless. 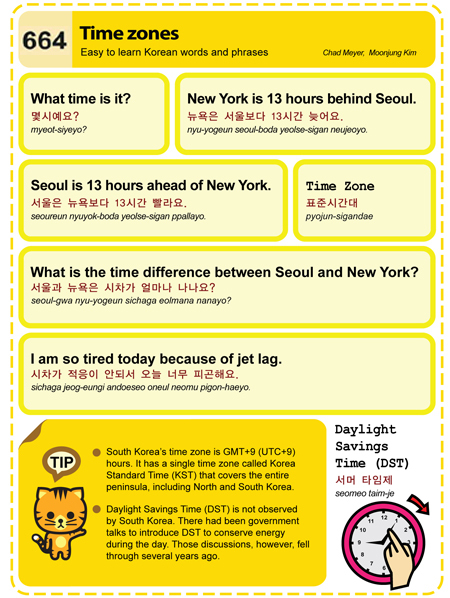 This entry was posted in News, Series and tagged Daylight Savings Times, DST, jet lag, New York, Seoul, time, time zone, UTC+9 by easykorean. Bookmark the permalink.